NOAA still predicts a strong chance of an El Nino warm phase developing into the winter, which correlates with milder temperatures and less snow most years. Disclaimer: it WILL snow, Minnesota WILL enjoy a fleet of cold frontal passages. But statistically, odds do favor a less severe winter than last year. The Old Farmer's Almanac is picking up on this trend, saying "We expect to see above-normal temperatures almost everywhere in the United States, except in the Southwest." While Hurricane Lane churns toward the Hawaiian Islands, possibly the first direct strike since Iniki in 1992, Minnesota's weather appears relatively tame. Lukewarm sunshine lingers today and Thursday, but a few waves of T-storms may complicate matters Friday. Plan on 80s this weekend with a few pop-up storms into Monday. A Spandex Alert is in effect for Monday, with a sweaty high close to 90F. You've been warned. Visible Satellite Loop. Tuesday animation courtesy of NOAA. Wettest Day: Friday. The 00z NAM prints out about a half inch of rain for the MSP metro; most of that coming late Thursday night and Friday from a few waves of showers and T-storms sprouting along the leading edge of hotter, more humid air. Storms should become more widely scattered over the weekend. Map: pivotalweather.com. Heat Lingers Much of USA. Looking out 2 weeks the GFS model prints out a sprawling ridge of (hot) high pressure for much of the USA, with the exception of the Pacific Northwest. In spite of a few emboldened cool fronts over the northern USA I doubt autumn will be in much hurry this year. Major Hurricane Lane - packing winds of 150 mph as of Tuesday morning - is expected to weaken later this week. However, it has the potential to move dangerously close to the Hawaiian Islands later this week, bringing the potential of tropical storm and hurricane force winds and heavy rain along with it. 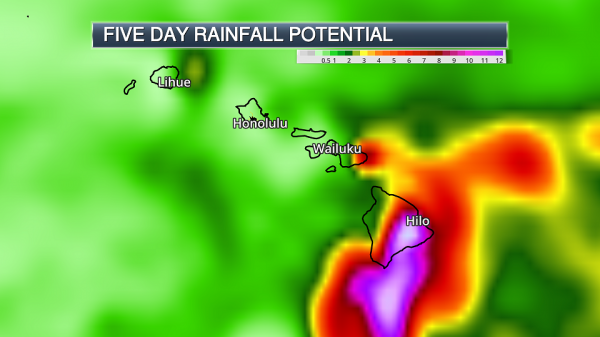 Facilities in Hawaii should continue to monitor for potential impacts from this system over the next several days. 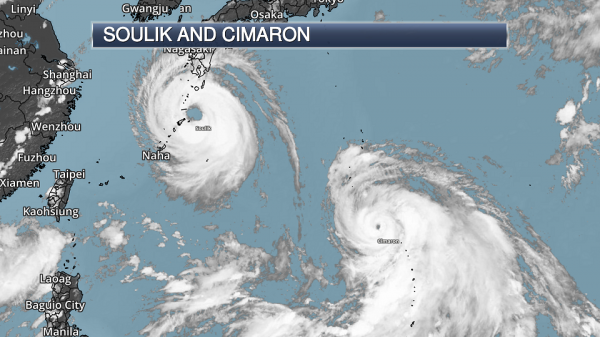 In the western Pacific, two typhoons will impact Japan through the end of the week - Soulik and Cimaron. The worst impacts from both systems will be west of Tokyo. Lane On Satellite. Major Hurricane Lane has continued to gain strength out in the Central Pacific, containing winds of 150 mph as of Tuesday morning. Lane was moving to the west at 12 mph. Forecast Track For Lane. 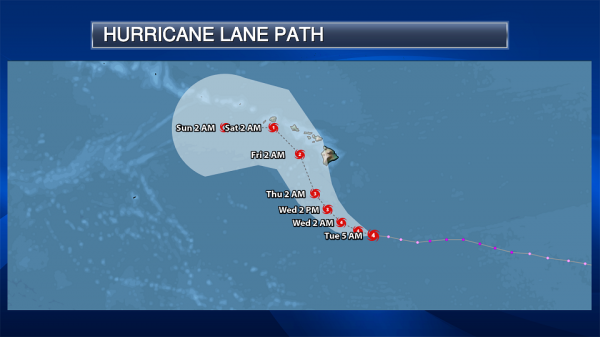 Lane is expected to continue westward throughout the day, slowly losing forward speed. As we head into Wednesday and Thursday, Lane will start to move more northwest and move dangerously close to the Hawaiian Islands. While we do expect this storm to be weakening as it moves past Hawaii, it is expected to remain a hurricane for much of the next five days. 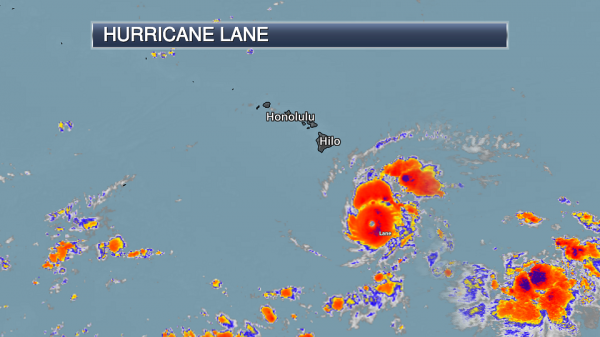 By the end of the week, the system will turn back to the west, moving away from Hawaii. Hurricane Watches. 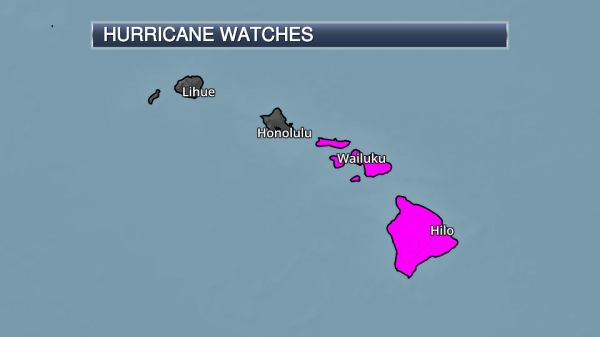 As of the 5 AM HST update, Hurricane Watches have been issued for Hawaii and Maui Counties. This means hurricane conditions will be possible in the watch area, and are typically issued 48 hours before tropical storm force winds are possible across these areas. Tropical Storm Force Wind Potential. 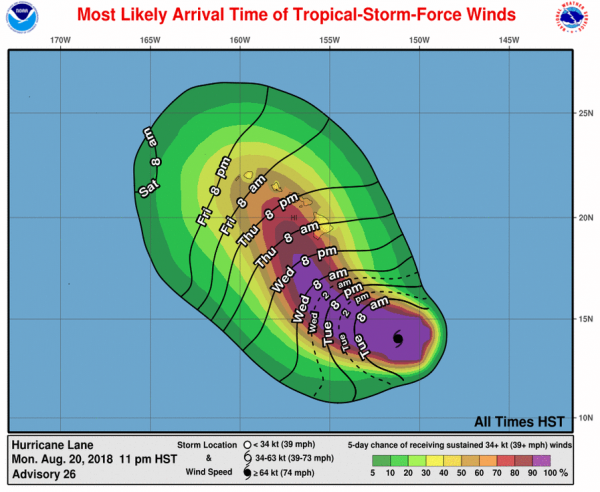 By Thursday morning, tropical storm force winds (39+ mph) will likely be impacting parts of the Big Island of Hawaii, spreading across the rest of the state Thursday into early Friday. Many of the islands have at least a 50% chance of seeing tropical storm force winds over the next five days. Hurricane Force Wind Potential. 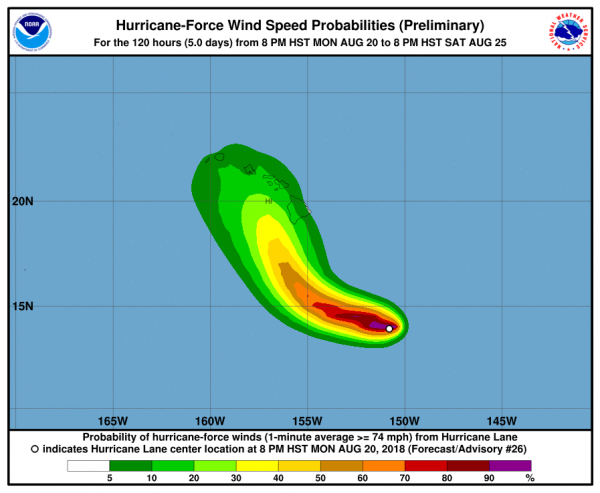 While the National Hurricane Center hurricane force wind potential graphic has low probabilities (mainly 20% or under) of 74+ mph winds across Hawaii, I certainly can’t rule out the potential of these types of winds, especially with how close the system could come to the state. With uncertainty in the exact path of Lane, this will be something to watch over the next several days. Rainfall Potential. We will be watching the potential of heavy rain as well across Hawaii as Lane approaches and moves through the region from Wednesday into the weekend. This rain could lead to flash flooding and mudslides. Two Typhoons In The West Pacific. Over in the western Pacific, we are tracking two typhoons which will impact Japan over the next several days. As of Tuesday morning U.S. time, Typhoon Soulik was impacting parts of southern Japan with 115 mph winds (the equivalent of a Category 3 hurricane). Soulik was about 235 miles northeast of Kadena Air Base and was moving to the northwest at 15 mph. Meanwhile, Typhoon Cimaron had winds of 85 mph and was moving to the northwest at 18 mph. Soulik will continue to move to the northwest through Wednesday local time, slowly starting to weaken. Soulik will continue to impact parts of south Japan through the middle of the week before the system takes more of a turn to the north, bringing it into South Korea Thursday. 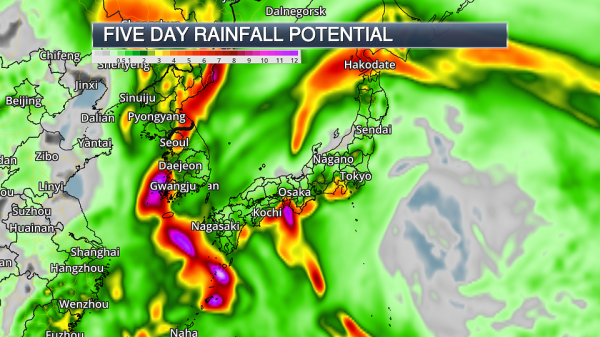 Strong winds and heavy rain are likely across southern Japan into South Korea. Cimaron will continue to move northwest through Thursday local time before take a turn to the north, gaining strength while doing so. 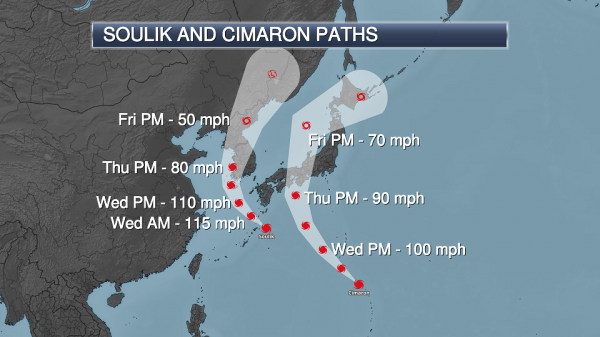 Cimaron will make landfall across parts of Japan late Thursday or early Friday further east than Soulik as the equivalent of a Category 1 or 2 hurricane. Cimaron will bring the potential of strong winds, heavy rain, and storm surge along with it, but at the moment it appears the highest impacts from this system will be west of Tokyo. 5 Things To Know About Hurricane Lane. Dr. Marshall Shepherd has perspective in a post at Forbes: "...According to hurricane forecasters, the weather forecast models have gradually converged to a solution that brings a northwest turn to Lane over the period Tuesday to Thursday (graphic above). By mid-week, Lane will be on the western side of an area of high pressure called a ridge, which will influence its more northwesterly trajectory. Initially this week, one of the more reliable models run by the Europeans was on the left side of the range of forecast tracks but has recently clustered with other models. The American GFS model (graphic below) brings Lane perilously close to the major islands by Thursday evening..."
Geocolor Visible Satellite Image showing cloud cover (and smoke) courtesy of NOAA and AerisWeather. What the Hail is Going On Here? Are you getting a little sick of repairing or replacing your roof shingles? Homeowners insurance premiums are trending upward, and one big reason is the frequency of extreme weather events. 2018 is likely to be the eleventh year in a row with $10 billion in claims from hail damage in the USA. Meteorologist D.J. Kayser at Praedictix posted a story listing some of culprits: urban sprawl, home sizes, and the cost of roofing materials. 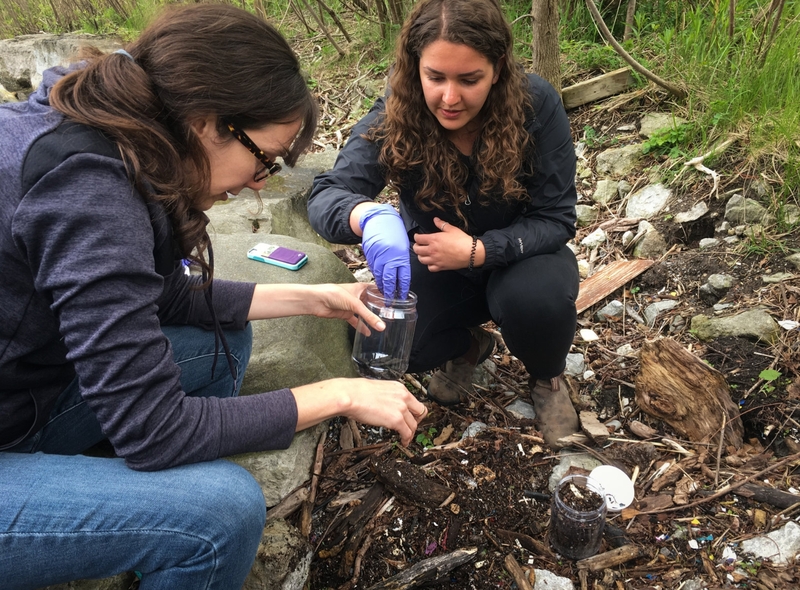 It's too early to know if a warmer, wetter climate is a factor. A study at Nature Climate Change in June 2017 showed that while the number of hailstorms may decrease in a warmer environment, the size of the hail would likely increase. Dr. Mark Seeley has data showing an increase in cases of large, baseball-size (2.75"+) hail in Minnesota since 1955. Minnesota Hail Trend graphic courtesy of Dr. Mark Seeley. 11th Year in a Row of $10 Billion in U.S. Hail Damage? Praedictix meteorologist D.J. 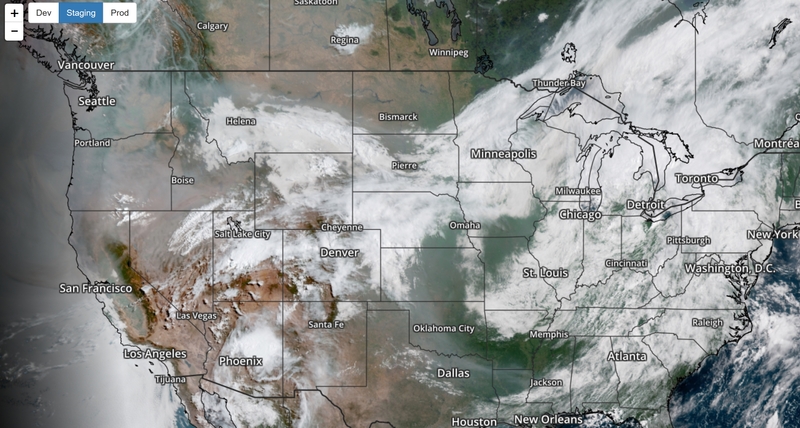 Kayser wrote an eye-opening post about hail trends in Minnesota and the United States; here's an excerpt: "...A recent conference in Boulder, Colorado, focused directly on hailstorms. At this conference, Ian Giammanco, a lead research meteorologist of the Insurance Institute for Business & Home Safety, said that approximately 70% of severe weather insurance claims filed yearly are from hail damage. Experts say that already in 2018 insured severe weather losses are at $8.22 billion (most of that due to hail damage) and that this year is likely to be the eleventh year in a row with $10 billion in claims from hail damage. Meanwhile, according to Bryan Wood, a meteorologist for Assurant, costly hailstorms have been increasing due to three factors: urban sprawl, home sizes, and the cost of roofing materials. He has more details on that over at the Washington Post’s Capital Weather Gang. Did you know? A study released in Nature Climate Change in June 2017 showed that while the number of hailstorms may decrease in a warmer environment, the size of the hail would likely increase..."
Why Ravaging Heatwaves Matter to the World's Dinner Table. Bloomberg explains: "To see the impact of record-breaking temperatures around the world, watch wheat. Found in everything from bread to noodles, biscuits to cereals, beer to cakes -- there is no more widely grown staple crop and more than 170 million metric tons trade every year. So when the weather ruins harvests in one spot, it can shock markets and economies that are thousands of miles away. It’s a weak global harvest, but not a disaster. The biggest growers -- Russia, Australia and the European Union -- have been hurt by high heat or widespread drought and as a result, the world is heading for the first deficit in six years. While harvests in some places, especially northern Europe, have been terrible and cost farmers billions of dollars, no one is expecting major shortages..."
The 2008 Financial Crisis Never Really Ended. 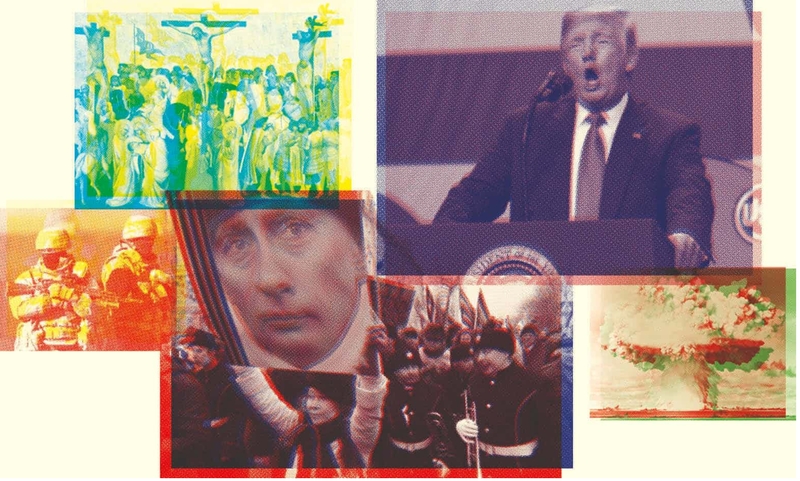 So says a book highlighted at Quartz: "...Crashed tears apart the notion that the 2008 crisis was American, and then, separately, a few years later, there was a European sovereign debt crisis. These crises, Tooze writes, were intrinsically linked in part because European banks had heavily involved themselves in America’s financial system. And this also meant Europe was deep into the US subprime-mortgage market—nearly a third of high-risk mortgage-backed securities that weren’t backed by Fannie Mae or Freddie Mac were held by European investors. One of the surest signs of the deepening of the crisis was the desperate attempts of banks, particularly European institutions, to access dollars. Interbank lending rates sky rocketed and worsened the crisis. With the wisdom of hindsight, Tooze believes the critical intervention that mitigated the crisis was not the bank bailouts or central bank asset-buying programs but rather “unprecedented transnational action by the American state” to pump dollars into banks all over the world..."
77 F. high yesterday in the Twin Cities. 80 F. average high on August 21. 80 F. high on August 21, 2017. August 22, 1910: Daylight is dimmed in Duluth due to smoke from Rocky Mountain forest fires. August 22, 1870: Downpours across southern Minnesota produce 5 inches at Sibley, and 3.49 at Ft. Snelling. Much of the wheat crop is damaged. Capitalism Can Crack Climate Change. But Only If It Takes Risks. The Guardian has an Op-Ed that resonated with me; here's an excerpt: "...But normally creative destruction takes time, especially if the old guard can marshall sufficient resistance to change – something the fossil fuel industry has been adept at doing. It is vital that capitalism’s Dr Jekyll emerges victorious over its Mr Hyde. More than that, it needs to be an immediate knockout blow. In the past, politicians have only tended to focus on climate change when they think there is nothing else to worry about. Tony Blair, for example, commissioned a report from the economist Nick Stern into climate change during the years before the global financial crisis, when growth was strong and wages were rising. Margaret Thatcher only started to talk publicly about protecting the environment when the economy was booming at the end of the 1980s..."
It's So Freaking Hot, Now What? An interview at FiveThirtyEight caught my eye; here's an excerpt: "...My point here isn’t that conservatives are bad, bad, bad. My point is that we keep having these debates about climate science … while ignoring that what the debate is actually about is political philosophy. maggiekb: You can’t show people enough charts to make them believe climate change is a real threat if they feel like accepting what they see in the charts is going to hurt them and their family. And I think that’s the fundamental political problem here. 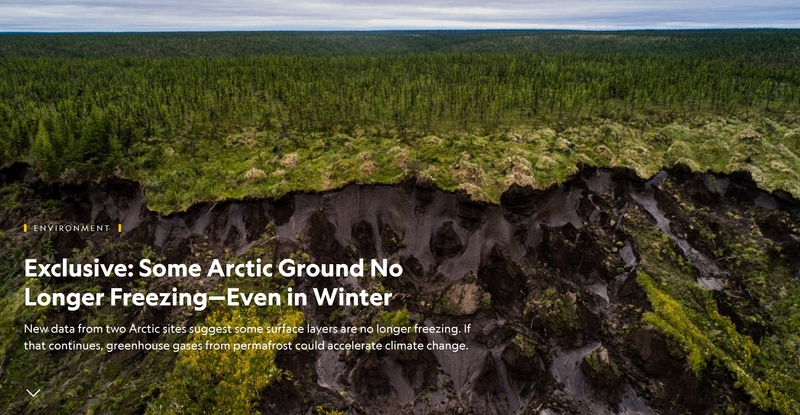 What the corporations did right (for their purposes, not for the planet) is to turn the science (that you can’t argue about) into a proxy for political philosophy (which you can)..."
How Can We Address the Effects of Climate Change on People of Color? 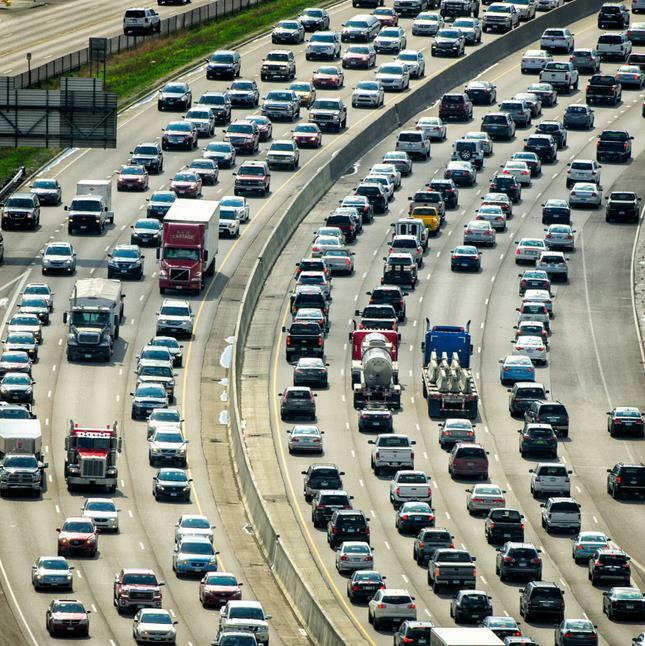 Here's a clip from an Op-Ed at The Miami Herald: "...The most at-risk population are poor people. 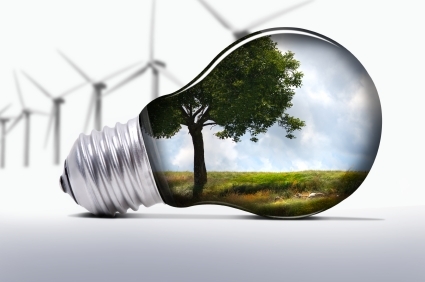 They have the least amount of resources to escape the effects of climate change, by buying products or services to make weathering the changes easier. There is also increasing concern about the concept of “climate gentrification” — low-income residents being pushed out of higher elevation zones in South Florida. But in a region booming with redevelopment and market demand that have rapidly turned once struggling neighborhoods into trendy areas, many factors could be at work, including climate concerns..."
Photo credit: "A man bikes through the flooding in the streets of Sweetwater in October." AL DIAZ adiaz@miamiherald.com.